This is my Acapulco coloring sheet. Well, a couple of weeks ago, that day arrived. Each square in the pyramid represents $1,250 worth of Discovery Toys products that I have sold this year or that the new consultants on my team have sold. Once we hit $37,500, I earn an all-expense paid trip for two to Acapulco. The last three flags at the top represent the final $3,750 left to sell. The last 10 percent. I love having this goal to work toward. The first time I made it a goal to earn an incentive trip four years ago, it seemed like such a stretch. Now, going for the trip is a no-brainer. It’s actually my minimum. The goal is no longer even about WHERE we would go on the incentive trip. We’ve traveled to The Bahamas, Rio deJaneiro and this year to DisneyLand. Some of the trips were perfect. Others were rainy. Some met all of my expectations. Others didn’t. And I realized that it’s not so much about spending the perfect week on the perfect vacation, but the personal satisfaction of working toward something and achieving it. It feels so good to be so close to my goal. It feels so good to see that sheet almost colored in. But once it’s complete… especially since I intend to finish the chart before the Dec. 31 deadline… it also brings a bit of aimlessness. What do I do now? I was amazed to learn recently that only 32 percent of people set a goal of any kind in life. And truly, I can’t say that I’m that much better. There are so many parts of my life that are more important than earning free vacations where I don’t have concrete goals. That’s something I’ve been thinking about a lot lately. 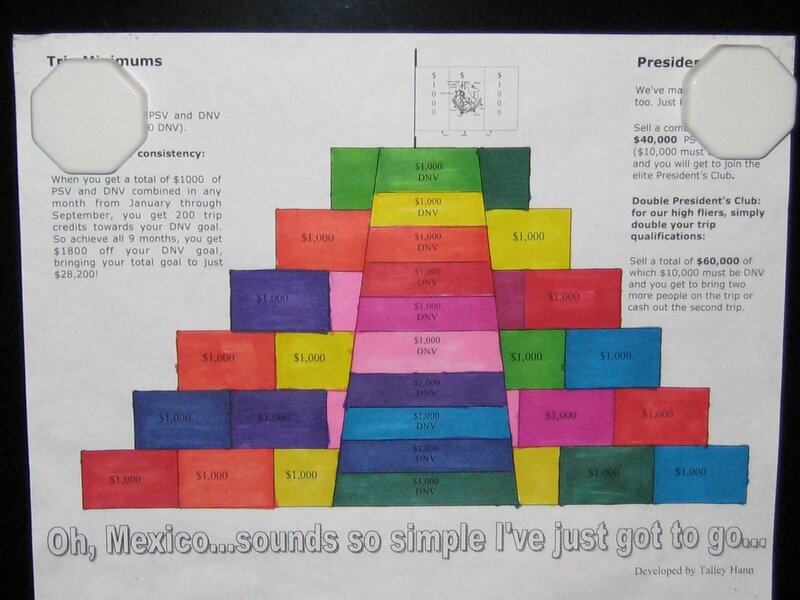 I need to make coloring charts in some areas with more lasting value. But I will say this. Setting a goal and making it part of our family’s life, has taught my kids a lot. My children understand that Mommy doesn’t always feel like doing her job. Many times, I would rather be doing something more fun. But if I can just focus for even a few minutes a day on where I’m going, then at the end of the year, we experience a tangible reward. Those baby steps each day add up to some giant leaps over time. A few weeks ago, my 7-year-old’s class was trying something new in gym class. “My goal was…” my son told me, and I smiled, feeling like Super Mom for a minute. So, they are learning something from all of this. He knew what he was shooting for. He knew where he was headed. How about you? What’s your goal? Previous Post Previous post: a little help, please? Next Post Next post: Are you as smart as a second grader? Great work on earning your trip! Hope today propelled you along well.Goals? I have them. And I can reach small, short-term ones I set, but I have yet to reach any big goals for the year (even if they seem measurable & attainable). What is your secret? My “secret” IS my coloring sheet! Well, that and breaking down my goal into monthly and weekly chunks and creating an action plan and going to work even when I don’t want to and, and… But really, having a visual is a great tool to help you focus on something each day!